Use and share this page www.AlamoAreaBSA.org/Marketing as a resource in support of Scouting through marketing. 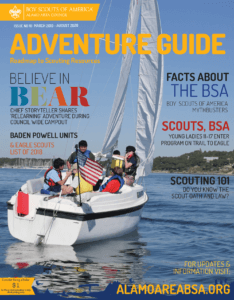 The National Boy Scouts of America main marketing/branding resource page can be found by clicking HERE. For more information, contact the Alamo Area Council’s Scouting Relations and Communications Team by email at marketing@AlamoAreaBSA.org. Marketing is the process of influencing the behavior of one or several people so they will make a purchase, cast a vote, offer a contribution, or join an organization. Put the right product in the right place, at the right price, at the right time. The Boy Scouts of America’s national “umbrella” marketing programs are designed to increase national awareness about Scouting, while encouraging local participation and donor contributions. To understand the philosophy behind these marketing efforts, it is important to understand how they impact the organization’s target audiences and the product-adoption process—the psychological steps consumers, or target audiences, go through from the time they learn about Scouting to the time they actually buy into the program. Moving a target audience along the product-adoption continuum requires extensive, focused marketing efforts. The National Council’s efforts create awareness and interest, but the local Alamo Area council must complete the sale by convincing community members to become involved in Scouting in some way. “Scouting makes the most of the little time parents and San Antonio leaders have to impact their children. By working together, we can support San Antonio youth to be Prepared for Leadership…for Service…for Learning…for Adventure…and most importantly for Life. Please support Scouting by giving or volunteering today!” ~ Michael de los Santos, Scout Executive / CEO, Boy Scouts of America, Alamo Area Council. In just four words, the Alamo Area BSA theme communicates where we keep on keeping the “main thing” – our kids – the main thing. The “Unified Focus On Youth” theme was launched in 2013 and incorporated into mosts of our marketing material, including our Give the Adventure donor campaign. It’s also a statement of our purpose to serve more youth! Public relations is communicating with various sectors of the public to influence their attitudes and opinions in the interest of promoting a person, product, organization, or idea. Public relations is one element of marketing. Public relations is primarily a communications tool, whereas marketing also includes needs assessment, program development, promotion, and sales. Public relations is a two way open communications tool, whereas marketing is mostly one direction. Public relations seeks to influence attitudes, whereas marketing tries to influence specific behaviors, such as purchasing, joining, voting, etc. Public relations does not define the goals of the organization, whereas marketing is involved in defining aspects like mission, strategy, potential members, and services. For council website, contact the site administrator at webmaster@AlamoAreaBSA.org. For support with online training or other site features found within the National Boy Scouts of America (BSA) sites my.scouting.org, contact the BSA Member Care line at 972-580-2489.